The Lexus RC operates in a field that includes the BMW 435i, Mercedes-Benz C350 and Audi A5. At nearly every turn, the RC out performs one or all, be it in standard features, pricing, or outright performance. Lexus understands the competitive nature of the luxury sport coupe segment and the RC is poised to dominate. The RC's performance begins under the hood. Power comes from a choice of two engines, a turbocharged 2.0L 4-cylinder that is capable of 241 horsepower and 258 lb-feet of torque, or a naturally aspirated 3.5L V6 is good for 260 horsepower and 236 pound-feet of torque. The 2.0L is only available with rear-wheel drive, while the RC300 and RC 350 are offered with a choice of either rear or all-wheel drive. Lexus' "all-weather drive" system uses an electronic center differential to vary torque from the standard 20/80 front/rear to as much as 50/50. Braking in all RC models is quick and powerful, thanks to big 13-inch front brake rotors. Outside, all RC models feature standard 18-inch alloy wheels, LED headlights and taillights, and heated exterior mirrors with integrated turn signals. Inside, the RC includes NuLuxe interior surfaces with aluminum and wood accents, a 60/40 split-fold rear seat, automatic climate control, Bluetooth hands-free connectivity, cruise control, HomeLink, a 10.3-inch VGA screen, a 256-watt, 10-speaker audio system, back-up camera and more. The all-wheel drive RC 350 also features heated front seats. Safety is paramount on the RC, and standard features include the Lexus Safety System+ multiple airbags for front and side, anti-lock brakes with electronic brake-force distribution and brake assist and traction control. 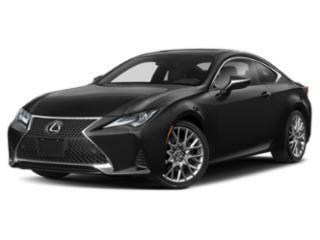 The Lexus RC returns for 2019 with updated styling around the front grille, headlights and taillights, including new daytime running lights and new, sleeker looking exterior mirrors. Inside, a new clock, a new start/stop button and a knee pad make things a little more comfortable for drivers and passengers. In addition to the aesthetic changes, Lexus have recalibrated the suspension and the power steering for improved handling. Apple CarPlay and Amazon Alexa have also been integrated into 2019 models.